21/10/2007 - SHENLEY RAISES �0 TOTAL IN FOUR PITCH CHALLENGE! Shenley Church End CC completed their mammoth Four Pitch Challenge, finishing 10 mile walk - taking in 3 former grounds under the club's various past pseudonyms - at home ground Manor Fields to raise money for the club, producing a massive �0 between the squad of 12 who took part. 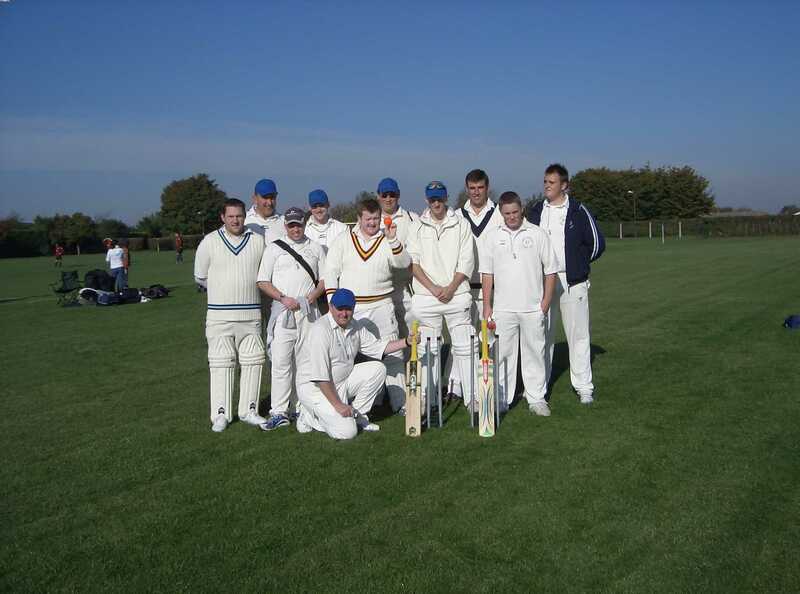 An absolutely superb day weather-wise hosted the club, who were attempting the feat whilst dressed in full Cricket whites and carrying stumps, bats and equipment. Even some completed the walk in gloves, pads and in one case, a helmet. No doubt a real sight for some people travelling around Milton Keynes that day! Andy Peacock, Richard Fletcher, Dave Morley, Chris Peacock, Anthony Brace, Stuart Burke, Mike Camwell, Graham Teagle, Ian Peacock, Simon Sidwell, Jay Fletcher all took part, joined by Anton De Beer halfway through - fresh from celebrating South Africa's win over England the Rugby World Cup final. Indeed, most were suffering from the night before's exploits when congregating at Bletchley Tesco car park for the meet, organised by Chairman Ian Peacock. 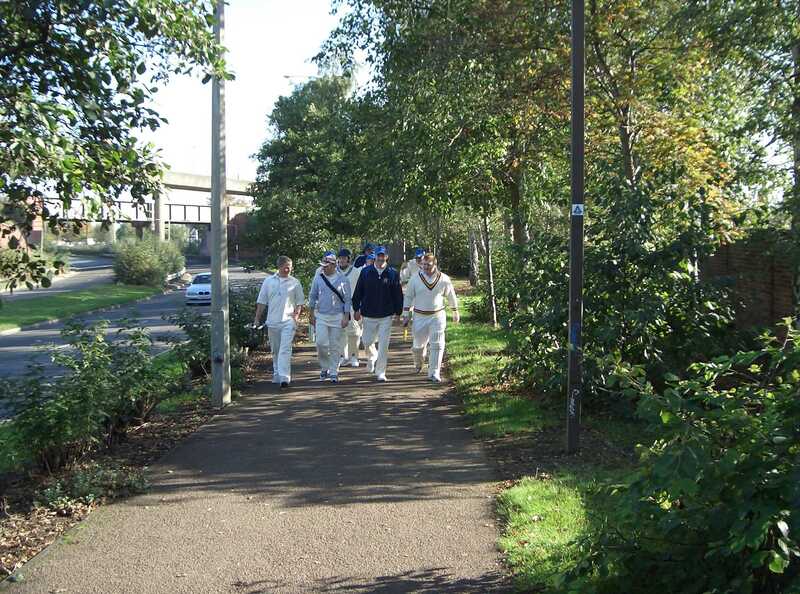 Teagle, Jay and Brace all touted the fact they were using full kit for the walk, to the guffaws of the less gullible. 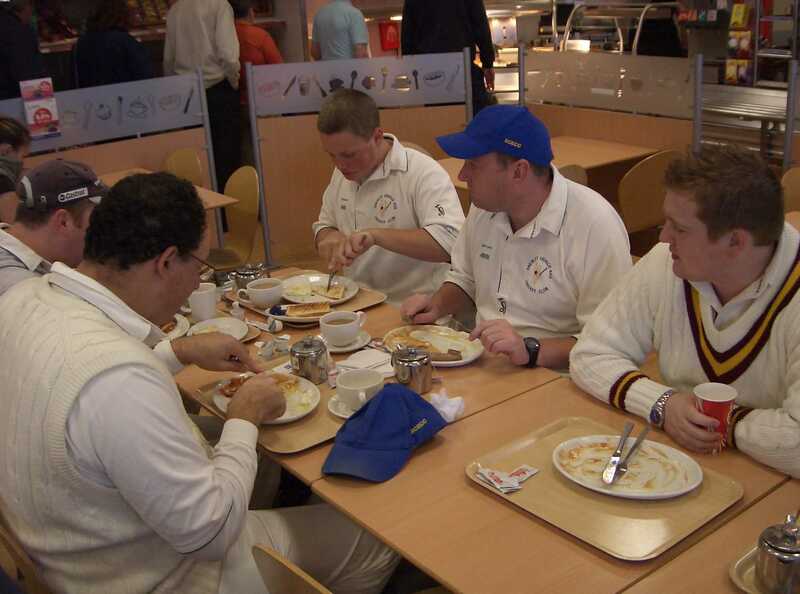 This didn't matter - the club members sat down to a hearty Full English breakfast in Tesco's restaurant, the larger members leading the way and the canteen staff frantically cooking more bacon. 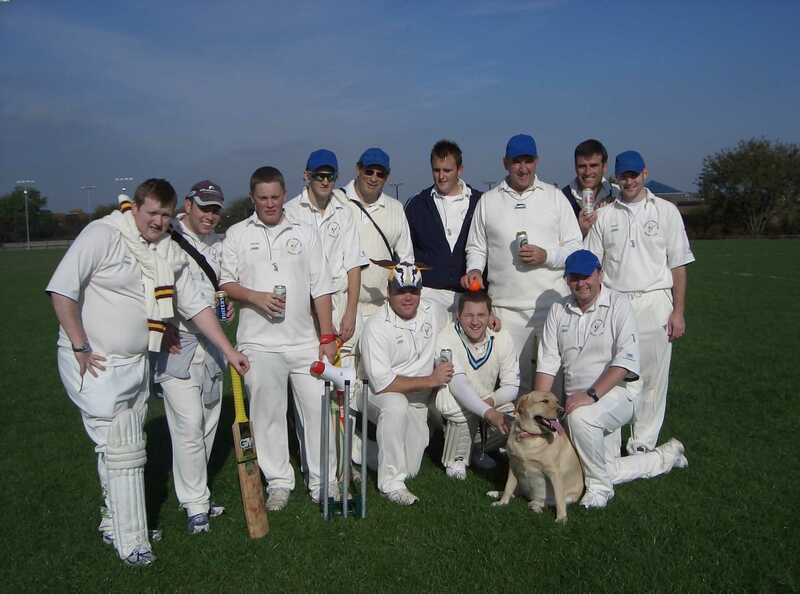 This went down a treat with the more full bloodied cricketers, but short-lived it was, time to nip round the back of Tescos (oo-er) and play our first over. A security guard enquired and told us gracefully to finish up and leave, though did not deter us, after informing him of our feat and his employer's suitable permission, the guard graciously bid us farewell. 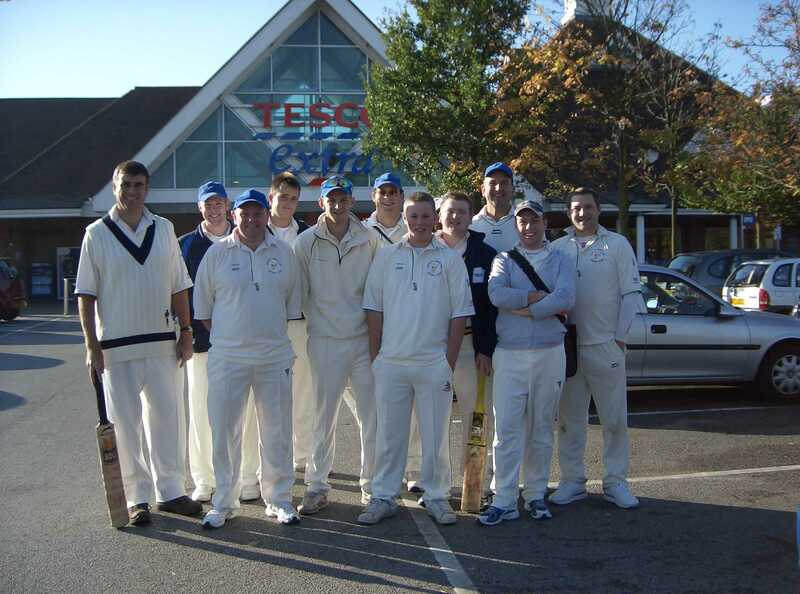 For those who didn't know, the site of Tescos car park used to be on the cricket ground for Rodexians, a former club name of ours - hence a natural starting spot. Off we set, marching resolutely down Saxon Street, onto Buckingham Road and finally turning right onto Shenley Road, heading up to our next former ground at Rickley Park. Arriving in good spirits and hangovers fading, Shenley superbly interrupted two Sunday league football matches on their half time break. With four teams looking on in bewilderment, the club set stumps between two pitches and began an impromptu game of Cricket. 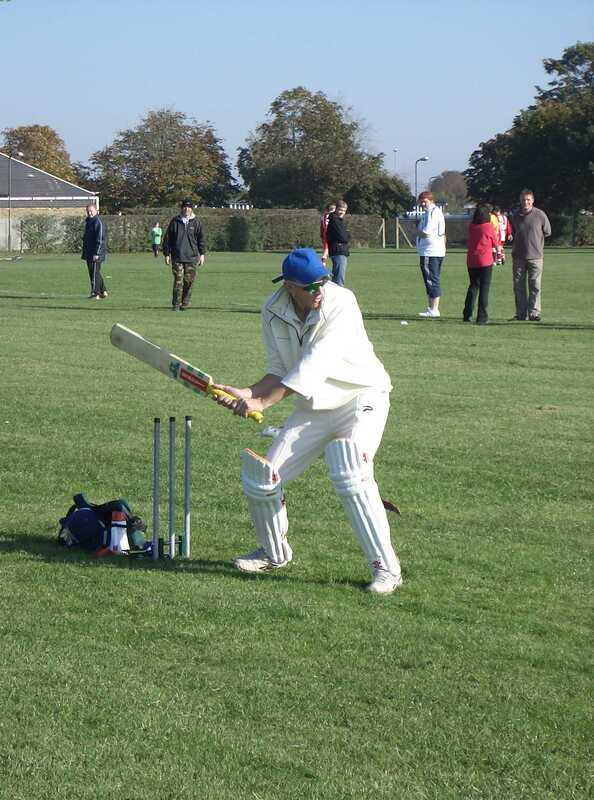 Cheered on roundly by all, batsmen Anthony Brace managed to get out twice before packing up and walking off just as quickly as they entered... strangely one of the football matches saw their linesman return after a 40 minute visit to the shops...!?! An umpire would never leave a Sunday cricket match! Next stop on the walk was only a short walk away - well, best part of half a mile - La Maison de Peacock - aka Andy's gaff. Provided with food and drink by servant, erm, wife Judy, a small rest ensured everyone will be ready for the mammoth leg to Denbigh School. This was also a time to reflect on the journey ahead, to work out the route (see Boris, really he was checking out his constituency boundary) and also the important stump swaps - what, you thought we didn't carry everything!?! Walking through Emerson Valley, through the picturesque settings of leafy Furzton and subsequently Furzton Lake, the football trivia questions arose, which went some way to forgetting about the distance being covered - until Dave Morley brought us back down to earth by commenting about his pedometer total, stating just over 5 miles. Great. We'd only just gone over halfway! One member of the cricket club had yet to put in a appearance. 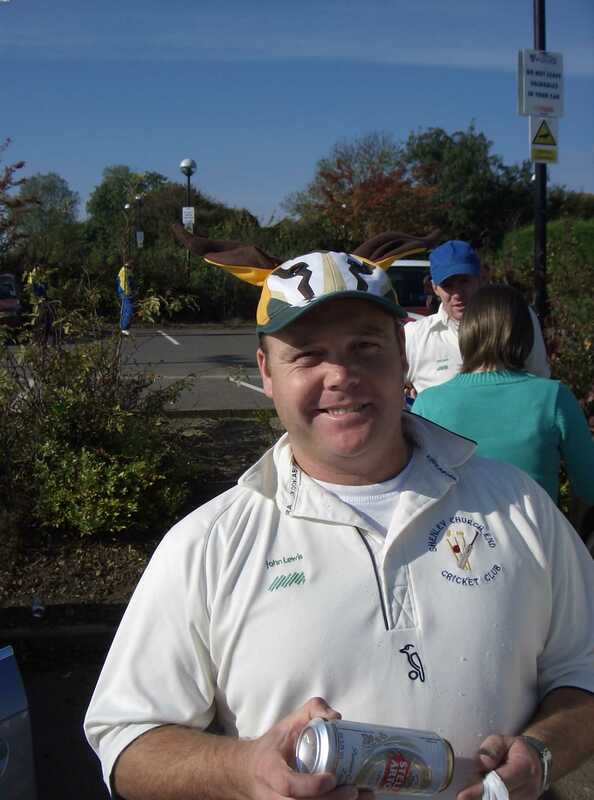 Forgetting the previous night's rugby match, South African stalwart Anton De Beer made a timely appearance in Shenley Church End itself to a torrent of friendly natured (that's what he thinks!) abuse about the England try, that wasn't a try, but really was, but wasn't. He was forced to don a Springboks cap for the journey upto the school, where various members of the Fletcher clan joined us for moral support. A weary over later we set off for the longest leg down to Manor Fields. Many were finding the Tesco breakfast was wearing off - except for the walkers who stopped for chocolate in Shenley shop. Good move! Other randomness saw Ian teaching Anton the origins of the railway bridge and it's sign, visible when going northbound up the A5, and Chris delirious storming ahead of the pack in order to complete the challenge quicker. Rolling past the Audi garage, completing the loop passing Bletchley Tescos, through into Fenny Stratford and into Manor Fields. Shenley completed the final over of the day square side, relieved that the feat was finally over and proper recovery could take shape. 10 miles took approximately 3 hours to cover, but the announcement of a final sponsorship total of �0 was a lift to all. Congratulations to all that completed the Four Pitch Challenge!